Zebra Medical Technologies is part of a new breed of medical device companies. They understand the reality that the funding market for truly novel, innovative devices is tight along with a host of other hurdles so they are always looking for advantageous ways to get more done with less resources. Based in the heart of Silicon Valley in Mountain View and hatched out of work done in the Stanford PhD program, Zebra Medical Technologies is creating a novel imaging system to permit live cellular pathology without cutting tissue. Their aim is to transform patient care across multiple medical regimes, and their current focus is to improve the diagnostics and treatment of skin cancers. Today we’re joined by Gabriel Sanchez, Zebra’s founder and CEO, and Kate Montgomery, their lead R&D scientist who both have quite the impressive backgrounds. Gabriel got his BS in Mechanical Engineering at MIT before getting both his MS and PhD in the same discipline at Stanford. Kate also received her PhD from Stanford, hers being in Bioengineering, and it was there at the Stanford PhD lab that they first met. Having spent the last two years developing their technology at the prestigious Fogarty Institute for Innovation, they’ve also discovered some great business insights, such as the importance of quality management, and how leveraging technology has enabled them to be more efficient and pass a quality audit with flying colors even though they were going through the process for their first time. Gabriel’s and Kate’s backgrounds that have led them to Zebra Medical Technologies. What to expect to see and hear in the future from Zebra about the company’s novel imaging system, which provides an alternative to the current method of surgical biopsies for live cellular pathology evaluation. Jon Speer: I'm so excited to share this episode of The Global Medical Device Podcast with you, and I'm gonna be brief on this intro because I wanna get right to it. But on this episode, we have Zebra Medical Technologies, and Zebra is part of the new breed of medical device startups. 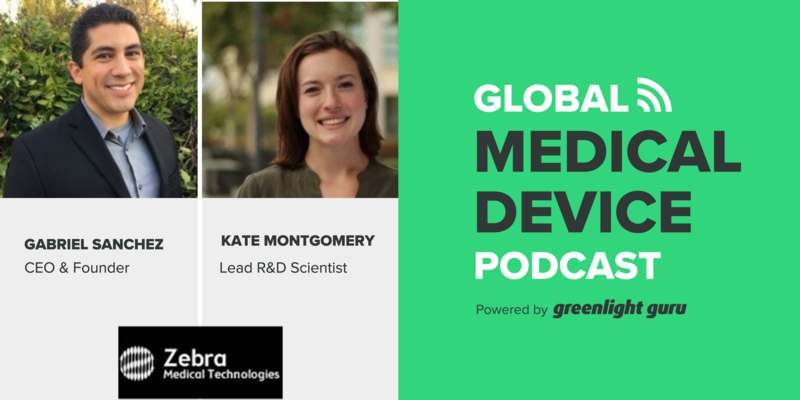 With me on today's episode of The Global Medical Device Podcast, we have Gabriel Sanchez, the CEO, and Kate Montgomery, the lead R&D scientist for Zebra Medical Technologies. And they share some insights and details of their business, but more importantly, how they figured out how important the quality management system is to, not only addressing, of course, the compliance needs, but how to dovetail these processes into their business to make them smarter, better, and more efficient. So sit back and relax and enjoy this episode of The Global Medical Device Podcast. Jon Speer: Hello. This is Jon Speer, the founder and VP of Quality and Regulatory at Greenlight.guru, and welcome to The Global Medical Device Podcast. Ladies and gentlemen, I'm very excited today. We have two members of an exciting new medical device company. The company is Zebra Medical Technologies. You can check it out at zebramedtech.com. They're part of a new breed of medical device companies, and I'm really excited to talk with Gabriel Sanchez, the CEO, and Kate Montgomery, the lead R&D scientist for Zebra Medical Technologies. Gabriel, Kate, welcome to The Global Medical Device Podcast. Gabriel Sanchez: Thanks, Jon. We're excited to be here. Kate Montgomery: Thanks for having us. Jon Speer: Absolutely. So before we dive too deep into the story today, tell us a little bit, I guess, about Zebra Medical Technologies and a little bit about your backgrounds and how you both got to the point of where you decided to jump into the medical device industry and start a startup. Gabriel Sanchez: Sure, Jon, I'll go ahead and start. This work originated from research I was doing at Stanford University. I was a mechanical engineer by training, did my undergrad at MIT, and then went to Stanford for a master's and a PhD. And I was developing a new type of technology based on something that's been used in academia for a decade, but has never been useful in the clinic just because it's enormous and impractical. And we were developing it, really, for a science purpose. We wanted to study muscle microstructure in vivo and see if we could study things like cerebral palsy, muscular dystrophy, and Gehrig's disease, really just to understand diseases better and in a basic scientific sort of way. I developed that technology for that purpose and did some papers and some studies with that, and as we did that, it's began to generate a lot of interest from the scientific community that, "Oh, this is a very useful new tool that could really boost science in a bunch of different realms." And so after my PhD, I was actually a lecturer at Stanford, so really wearing an academic hat. Gabriel Sanchez: But I realized that there was an opportunity in a research space, but then also more broadly, clinically. I realized that this type of technology would potentially be very enabling. If we could do it in this setting, it could be very powerful. So I decided after two years of teaching at Stanford to go out and go into the startup world, and that was back in 2014. And we've been at a place called the Fogarty Institute in Mountain View, California for the last two years, developing basic scientific discovery and research, and now a clinical version of the technology that we hope to bring imaging into the clinic. So what the product is, is it's a device that allows you to see cellular structures in living tissue. You don't require contrast agents or dyes, and it can be done, actually, non-invasively. And so it's something much akin to ultrasound, but at a much different scale, so orders of magnitude high. It's an interesting challenge because, not only trying to transition out of the academic setting, but it's a very innovative product. It's not an iterative device or a small change on something that's already existing. Gabriel Sanchez: Yeah, right. Well when you're working all night, it's one or the other. Jon Speer: But from my perspective looking in at Zebra Medical Technologies, both of you and the rest of your team are just the kind of people that, you just figure out a way to get it done, and you don't let things get in your way. You work within the constraints but figure out a way to not let those constraints to be limiting in any way, and I think you bring a very fresh approach to this, and you've achieved at least in my view of the world some pretty significant milestones in a very short period of time considering the type of technology that you're developing. So I know there's a long road still ahead, but so far I know it's good to take pause and look at where you're at and realize your accomplishments. But I do wanna congratulate you. I know there's a lot more yet to do. Jon Speer: And I guess I'll bring the audience to, I guess back several months ago, to when our journey, our paths first crossed so to speak, and at that point in time, obviously you were looking to roll out or improve upon your quality management system and you came to Greenlight.guru, and were interested in our platform and how that could be beneficial in helping you achieve some of those milestones. So I'm wondering if you could share a little bit about life before and maybe life after Greenlight.guru and how that platform has helped you achieve some of your milestones. Gabriel Sanchez: But then like you said, we have to be very strategic about where we're working and how much time we have available, and what tools we have available to do that. We were fortunate that my skill set takes skills, and also Fred, who's the other full-time member of our team with very diverse backgrounds coming from both the engineering training that we've had, but also typical of having done our PhDs in the biomedical spaces. So we've been able to, within our small team I'm CEO, but I still do a lot. I do the optical design, I help build devices with Fred. We do prototyping, take those quality recruit subjects. We both take data together when we're doing experiments, while Fred is chattering and doing the electronics and building products, so everybody's doing everything. We're all interviewing clinicians and talking to patients. So it's just this idea that we put sweat equity into it and do whatever it takes. Gabriel Sanchez: Part of that, like I said, is the tools that we have, so when we came to this point where we wanted to add quality into the system, we had started in the research market which is very unregulated. Since you're just doing devices for basic scientific discovery. We're now trying to develop the product for clinical applications. We knew we'd have to get quality systems involved in a much more substantial way, and so we evaluated multiple options honestly, that we've known from people in the space that are also in the startup space that we're working in, and no matter how we looked at it, it came out to that we felt that there were cheap options available, but they required a huge amount of time and oversight and usually the inclusion of at least a consultant that's not a full-time person to run the quality management system, and that just doesn't really fit with the vibe that we have. Gabriel Sanchez: We like to do as much as we can ourselves, and reduce cost. And we kept hearing about Greenlight Guru actually through a lot of the online and the podcasts and everything, and a lot of the materials that you had published on how startups should really startup a QMS system, and as we evaluated the technology, it became immediately clear that if we got in this technology and we put the time into running it, it's so versatile we would be able to drastically reduce the amount of time we would need from say a consultant or even if we needed one at all. And so, when we added up the cost of that, it was actually a no brainer. We felt that you would have this tool and it would save us hours, and for us hours are the most valuable thing, because we're all doing multiple things all the time. So that was really what attracted us to Greenlight. Jon Speer: Cool, and I remember the day, or actually as Kate had reached out, you had an inspection from the California Food and Drug Branch recently, and I remember it was about a week, maybe 10 days or so before that event, and I checked in with Kate and make sure everything was going okay and she was like, "Psh, I got this. There's no big deal." And [chuckle] then she reached out afterwards, and she's like, "Yeah, that was alright." So Kate, tell me a little bit about that experience, 'cause I think that was probably, if I'm not mistaken, one of the first audit-like situations that you've been a part of. Jon Speer: It's not like that. I'm just saying from my perspective, I'm sure you were super confident, but it's not that you weren't prepared and didn't do a lot of hard work. I'm sure all of that went into it. But yeah, talk a bit about that experience. Kate Montgomery: Yeah, so we had launched our quality system, and we didn't... I don't think that we fully, fully, fully understood the Food and Drug branch audit system very well beforehand, but we had worked really hard on getting our quality system up to snuff and making sure that we were taking care of our products. We have started putting even our research products under a quality system as well, because we felt it was important to have a well-made product just from that sense as well. And so we had these two products that we were managing under the Greenlight.guru quality system, and we had a few little holes to plug before the audit came, but it was really straightforward. If we didn't know, all-nighters were pulled to get everything up to speed and the auditor didn't stay too long, 'cause we went through all of our documents and he said they looked great. Gabriel Sanchez: Yeah, and I have to add, Jon, I think... I can't even imagine honestly passing it, let alone just trying to survive that process. If we had gone with a paper-based QMA. [chuckle] And we were trying to manage that with the small team that we have? I was blown away, to be honest, by how well that went, because we had absolutely everything that we needed in a way that he could digest it and then go through it and ask the questions he needed. And it was work, but it was surprisingly smooth [chuckle] and efficient and we were very happy with the result. Jon Speer: That's great to hear, and it's stories like that, that... This is why I can tell you personally why I enjoy what I do, and have for the amount of time that I've been in this industry. I've been in this space for 18 years and I love... For the past 10 years or so, I've loved working with company, startups specifically, and I can tell you working with companies like Zebra Medical Technologies, if I had my choice, I would work with companies like yours all day every day and for a few simple reasons. You appreciate what is required to be a medical device company. You're open and willing to learn about how and what to do and how to structure your systems and your documentation in a way that not only meets the regulations, but also becomes a part of your business. Kate, when you just shared that you found the value and some of the things that we've built in the workflows and the platform in Greenlight, and you've added your research projects into the system, that just tells me that you understand the business aspects of what Greenlight is attempting to do for medical device companies too. So just things like that that just make what I do super rewarding. So I do appreciate you guys sharing those stories and those insights into the life at Zebra Medical Technologies. Gabriel Sanchez: Yeah, we're happy to share, it's great. Jon Speer: So I'm sure there are a lot of exciting things [chuckle] probably even yet this year that you guys are out to accomplish and probably 2017 I'm sure is gonna be super exciting as well. So I know you're not gonna share the secret sauce, so I'm not asking you to share the secret sauce, but tell us a little bit about what we might expect from Zebra Medical that we can look for you guys in the news and magazines and all that sort of thing as far as how you're changing the world. What can we expect in the near future from Zebra Medical Technologies? Gabriel Sanchez: Yeah, it's great. So we're working on a couple of different value-added milestones right now. We are building a first clinical prototype. Greenlight is essential to doing this under the purview of the quality management system so that we can make sure that it's a good product that will be in compliance with the FDA when we go for that. We're basically prepping for an FDA pre-submission. We have a predicate device that we think is very good, and we're proposing a series of clinical experiments and studies that we'll be doing to validate that. Our hope is that we'll have this prototype built quite quickly, probably in the next four or five months, and then we'll be doing some pilot studies here at Zebra. We hope to publish those results. What we think this will bring, is we think this will bring into the clinic something that's just never really existed before. Basically the ability to do histology on living tissue. And I can tell you that there's an applications across throughout the body, but certainly in oncology detection where currently you have to always cut tissue out, send it to the lab and prep it and stain it, and wait for a pathologist to interpret it. And there's just so many things that are inspected that aren't actually cancer and don't need to even be cut out, but it's a challenge that you can only discover that by surgically removing tissue. Gabriel Sanchez: So our approach is if you have point-of-care microscopy that can see cellular structure, it will reduce costs in many different ways that will improve patient outcomes in many different ways, and it'll give physicians just better tools to treat their patient. So our hope is that we'll make tremendous strides in bringing that technology to reality in the next six months. Publish some of those results. And then our plan will be to actually raise a Series A financing so that we can take the next steps to get FDA approval and begin to commercialize the technology. Jon Speer: Man, that's fantastic. As you were sharing that detail, Gabriel, my hair on my arm was standing on end. That's really exciting, and I know you guys are excited about what you're doing, as well. So anything else that you wanna share with our audience today before we call this thing a wrap? Gabriel Sanchez: I would just say to anybody out there that's thinking about maybe getting into this space, that there are many challenges that face you. We've always known that. We've always known that the medical device industry, in particular, is heavily regulated, and has a lot of hurdles that other industries don't have. That hasn't changed, but financing has become very tight. Expectations clinically have become very tight, so it's becoming a harder and harder space to innovate in. I think that that could be trouble and I think it's important for us to continue to innovate in this space. I think it's very valuable and something that's very valuable on a national scale that the United States can really lead the way in terms of coming up with the most innovative healthcare products. I would say that if you're in this space and you're trying to innovate, that you have to always understand that you, you're only kind of good as your tools, and your people. And so you got to pick the right people. You have to have the right product, and the right application, but you also need the right skill set and tools necessary to implement that. Gabriel Sanchez: And I think that if we just... I hate to say it, but if you look at something like Theranos, where people cut corners and don't do the right things and quality, it'll just destroy you. And so I think that we've taken the approach that if we're gonna do anything, we're gonna do it right from the beginning. And that attracted us to Greenlight, and I would recommend to anybody that's in this space to very seriously consider Greenlight. And if you can't do it, it's gonna be harder [chuckle] than if you do, so if there's anyway you can possibly I would bring that system into your toolset. Jon Speer: I appreciate the feedback, and the insights. And again, I love following your story, and we're gonna catch up with you maybe it sounds like in about six months or so, it sounds like in that period of time, you'll be to that next significant milestone in your company. And it'd be great to follow this story, and for those of you listening at home again, go to zebramedtech.com. Be sure to catch up with Gabriel and Kate and follow their story. They're on an exciting adventure and their enthusiasm and the passion that they have for the technology that they're developing, it's certainly contagious for me. And I hope that it's been contagious for you as well. So again, thank you to Gabriel Sanchez, CEO, and Kate Montgomery, lead R&D scientist, for Zebra Medical Technologies for being my guests today on The Global Medical Device Podcast. Jon Speer: And as Gabriel and Kate both said, if you wanna do this, and you wanna learn how you can optimize your efficiency, and address those critical quality and regulatory compliance needs for your medical device company, it's pretty easy to learn more about Greenlight.guru, and how we might be able to help. Just go to Greenlight.guru. There's a button on our website that you can request more information, you can request a demo, and we're happy to have a conversation with you and teach you what this is all about and why it can help you. So, Gabriel, Kate, thank you, and we'll talk to you again soon. Gabriel Sanchez: Thanks, Jon. Looking forward to it.